Visit our Parts Store for all your RV needs from basic supplies to solar systems, generators and satellite systems. We have everything you need for camping and RV travel. 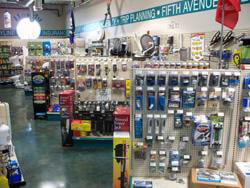 Our RV Service Center can also install all your RV parts and accessories. Make an appointment online now or call a Service Advisor at (916) 635-4545. Looking for a hard to find or specialty part? Fill out the form below and we'll check our resources to find it for you.